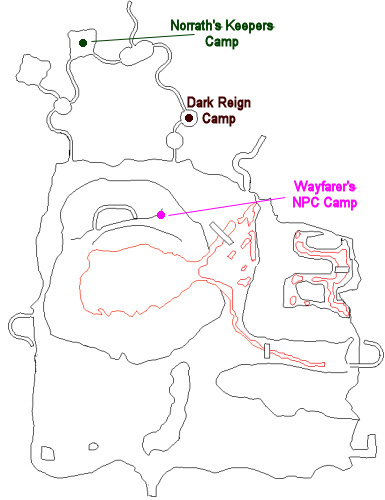 This group mission begins with Keeper Dilar Nelune (click for map image) in the Norrath's Keepers camp of the Lavastorm Mountains. - Completion of "Creating an Antidote"
- Completion of "Burning Arrows"
- Completion of "Greed of the Goblins"
You have been assigned the task 'Children of Gimblax'. Relae must have told you that Gimblax plans to extract vengeance upon you for killing the goblins in the temple. We have learned roughly where this foul goblin is and highly recommend you find your way to him before he finds you. The direction to the instanced entrance will be marked on your compass. Upon zoning into Tirranun's Delve, you find yourself in the far northern part of the zone. Gimblax is in the opposite end: Alone in a small cave at the far south. Make your way across the zone. Be careful as some mobs see invis. Charge Gimblax, and kill him. He hits for a max ~1,200; flurries; procs "Goblin Headbutt" (3-second stun); and has ~87,000 hitpoints. Gimblax has been slain by _____! Gimblax's corpse looks at you in disbelief before collapsing. As news of their leader's death spreads, the remaining goblins of the delve rapidly fall into chaos and disarray. Gimblax's threat is no more. It will likely be some time before you will need to be concerned with them again. I thought I would post this as a good mission for any fd class factioning at higher levels. Simply have a friend who has appropriate faction request it and then run to gimblax, FD and kill him. Takes all of 5 minutes for an FD class and is a nice faction hit. Shadow Knight: 1.0. Warrior, Shaman, Wizard, Druid, Ranger, Bard, Paladin, Berserker, Rogue, Enchanter: 1.0-.20. Necromancer: 1.0-2.5. I had three level 70s together and could not get this task. There must be some minimum faction for the *group* to get this task. Way old post, but for anyone reading this part .. and can't see the above line. "To receive this quest, you must first be indifferent to Norrath's Keepers and have completed the three small Tier 1 tasks that Private Nylaen Kel`Ther gives you. However, everyone in the party gets flagged for this win and will get the AA when they complete the other tasks at a later date. " When you kill Gimblax for the first time, you get a free AA. Is this a mission reward, or a progression reward. In other words, since this quest is repeatable, do you get the AA EVERY time you do it? I will write on a huge cement block "BY ACCEPTING THIS BRICK THROUGH YOUR WINDOW, YOU ACCEPT IT AS IS AND AGREE TO MY DISCLAIMER OF ALL WARRANTIES, EXPRESS OR IMPLIED, AS WELL AS DISCLAIMERS OF ALL LIABILITY, DIRECT, INDIRECT, CONSEQUENTIAL OR INCIDENTAL, THAT MAY ARISE FROM THE INSTALLATION OF THIS BRICK INTO YOUR BUILDING." Would i loose the AA if i participate in any dark reign mission or collect the token? Or would i oose it if i just turned in a token... as my guild often completed dark reign raids.... would a raid loose me the aa ? You only loose the faction if you turn in the token. As posted above, you can DO the dark reign tasks, as long as you don't turn in the tokens. Start doing Dark reign faction, and you LOSE the AAs. Just finished this with a group of 6 lvl 70's. You get 25 crystals. completed this last night and got AAs. However, just been rereading this and noticed "Chieftain Relae Aderi says 'It is time to repay you for all you have done. Firiona Vie has chosen to share a divine gift with you that will only grow stronger if you continue to help us. This magic to be instilled with you is a fitting reward, but you will fast lose it should you ever aid the Dark Reign -- in fact, it will disappear instantly!'". This begs two questions...does this AA INCREASE with time? And has anyone ever done a dark mission and lost it? Also, I believe it probably does fade if you did the dark missions.. this keeps people from going back and getting both sets of AA's. What is the actual lvl requirement for this, we had an avg lvl of 68 ( 2 - 70's a 67, and a 65 ) and also tried with avg lvl 68.4 ( 3 - 70's a 67 and 65 ) and still could not get mission every one in group had the prior tasks and char flags done. Do all peeps have to be at least 68? We did this with group average of exactly 68. Would not allow us to add anyone that reduced the level below that point. 1) Does this occur in an instanced zone? 2) "zone into Tirranun's Delve in the far south". From which zone? I am familiar with zoning in from Lavaspinners Lair. This really is in the far south, according to the map. But, if this is an instance, is the zone in from somewhere else and does it place me somewhere new on the map? I seek clarification because I play on Zek PvP. Lavstorm is perma-camped by a couple of uber guilds who make no bones about their desire to drive all but themselves off the server, either by movelog or by cancelling of accounts. So, it's critical to know in advance exactly what is what with these tasks. Spend 30 seconds too long dallying in Lavastorm or Broodlands and you are dead. Which is why the four zek's pre-merger had a population that rivaled the Test server. That is to say almost nothing. 1) Yes, this does occur in an instanced zone. To receive this mission, you must have from 3 to 6 players in your group (possibly 4 to 6). Once you have received the mission, you can add stragglers by typing /taskadd <playername> (or was it /addtask...?). The first step is to touch the cave entrance to Tirranun's Delve. This is an instanced entrance and is in the Broodlands almost due north of the entrance from Lavastorm. You'll have to go west around the mountain ridge, but then back east to the zone. Your compass points to the instance entrance. NOTE: This instance does not respawn. Upon zoning in, you are at the far north end of the zone (opposite of where you enter in the static zone). The exit to the zone is at the far south right behind Gimblax. The first part of the zone is roaming basilisks. Most groups invis past these and into the "castle". From here, most goblins see invis so you need to fight your way around. If you take the most direct route, there are about 20 goblins that you'll have to fight through until you get to the other castle entrance at the far south. Roaming this courtyard are about 6 drakes most of which do not see invis. It is possible to invis past them and engage Gimblax, but this leaves little margin for error and it's best just to kill them. Better safe than sorry. Gimblax is all alone right in front of the zone out. Highest hit I saw was in the 1200s. Every time I've fought him he Flurried, but others in the groups said he didn't Flurry sometimes. He doesn't have too many hitpoints though. Pretty easy mission for 33 crystals. To add to the part about 'task adding' I think that this is much like Emoush in that you can task add up until the point you engage Giblax. ie. you can not engage him, fail and try to add or swap anyone in or out. Have not attempted this with Gimblax but I know Emoush is this way. Anyone with first hand knowledge please feel free to confirm or deny this information. Also, how long is the lockout on this event on a win & also on a fail. Interested in knowing so I can get an idea just how many times I can help run people through this event and what time frame I am looking at to do so using the same charecter. Hmm, there also appears to be a minimum average group level for this, 68 I think. The other night we had a 69 shammy, 68 chanter, 67 cleric, 66 pally and 65 pally, all who were at the correct stage for Gimblax. We also had a 65 necro who had not begun the progression. We were *unable* to even get the mission, we kept getting the red message that our party did not meet the requirements. We tried to do it several different ways to no avail. I'd like to point out that gift of the keepers is only given to a person at the right stage of DoN progression. Also if the mission is done and then you do the first parts of the progrssion you get it, but its not a reward for doing the mission itself.